George French Angas was born in Newcastle-on-Tyne and studied under Benjamin Waterhouse, a natural history artist and lithographer, for four months in 1841. He travelled the Mediterranean and published 'A Ramble in Malta and Sicily in the Autumn of 1841... Illustrated with Sketches Taken on the Spot, and Drawn on Stone by the Author' in 1842. Angas arrived in South Australia in 1844 from England to attend to his father's pastoral and commercial interests. Almost immediately, he joined an exploring party which went through the Mount Lofty Ranges to the Murray, and thence to Lake Coorong. On this trip, Angas made drawings of the landscape, people and animals which they encountered. Further travels in NSW and New Zealand followed. 'South Australia illustrated' was published after Angas returned to England in 1846, based on drawings made on his journeys through the area in 1844-45. It was published simultaneously with 'The New Zealanders illustrated'. Both were issued in ten parts at two-monthly intervals over 1846-47. 'South Australia illustrated' was published by Thomas M'Lean with sixty plates and letter-press descriptions, additional text and title pages. Each part was priced at one guinea for subscribers and 25 shillings for others. When the issue in parts was completed, the full work was issued as one volume. M'Lean's lithographers did occasionally alter compositional elements and details in transferring the drawings to stone. 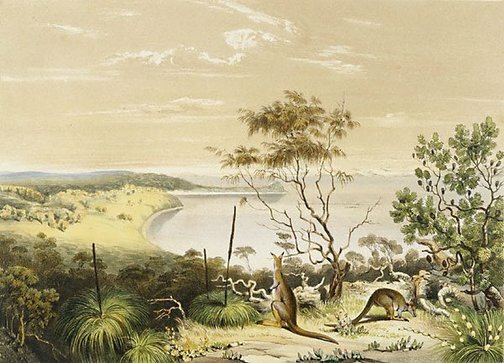 This image was the ninth plate; the drawing for it was made in January 1844, from the top of a large sandhill where the Coorong and Lake Albert meet. Angas wrote of the kangaroos: 'Numbers of the brush kangaroo (Halmaturus Greyii) were put up constantly and though our dogs took after them, these elegant little kangaroos always outstripped them for their extreme swiftness. This new and beautiful species, named after his Excellency Captain Grey, who procured the first specimen, is remarkably local in its distribution; being exclusively confined to the desert-scrub bordering on Lake Albert and the north-west end of the Coorong' (Angas, 'Savage life and scenes', pg. 70). They are now almost certainly extinct. Australian images: Prints, drawings and watercolours from the collection , Sydney, 1979, 5.